Northamber have linked up with Parallels to provide their Remote Application Server (RAS), a comprehensive virtual application and desktop delivery solution that allows employees to access and use applications and data from any device. Seamless and easy to deploy, configure, and maintain, Parallels RAS supports Microsoft RDS, Citrix XenServer, VMware ESXi, Microsoft Hyper-V, Nutanix Acropolis (AHV), and KVM. 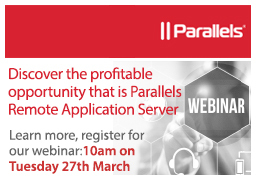 Virtual application and desktop delivery can be complex and expensive — unless you are one of thousands of businesses that use Parallels Remote Application Server to remotely deliver applications and desktops to their employees. For more details on Parallels talk to the experts at Northamber on 020 8296 7015.